My research focuses upon processes within the cratonic lithosphere, with a particular focus on the effects of redox state on metasomatism and melting, along with the distribution of trace elements in garnet peridotite xenoliths. 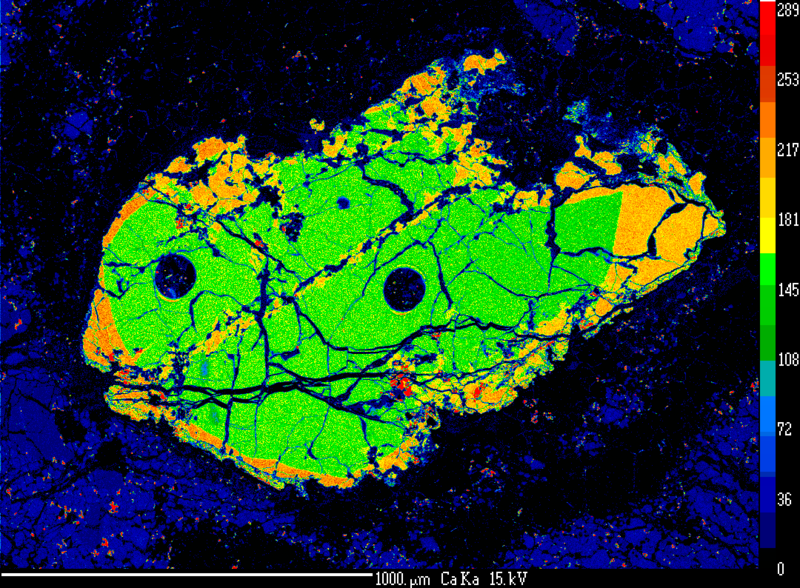 X-ray map showing the distribution of Calcium in a garnet (green/orange) from a peridotite xenolith from the Wesselton Kimberlite, South Africa. Obtained using the Cameca SX100 Microprobe at RSES. Redox state, which is often expressed as oxygen fugacity, is an important variable in the mantle that is becoming more understood as techniques for determining it have improved over the last few years. I have been studying two suites of garnet peridotite xenoliths sourced from kimberlite pipes in South Africa in order to determine their recorded oxygen fugacity and examine how this is linked with the metasomatic processes that they record. This process has involved investigating the samples using standard petrographic techniques, followed by major element analysis using The Cameca SX100 microprobe at ANU and UTas. Trace element analysis is performed using the Agilent 7700 LA-ICP-MS at RSES, whilst I have also used the Cameca NanoSIMS 50 at UWA to investigate diffusions profiles in zoned garnets, such as the one shown above. We have been determining the redox state of garnet by measuring the ratio of Fe3+/∑Fe using Fe K-edge XANES, which is a developing synchrotron technique that allows high spatial resolution and fast measurements, in collaboration with Andrew Berry and Greg Yaxley. Combining this data with major element concentrations of garnet and coexisting olivine and orthopyroxene allows us to calculate oxygen fugacity and establish a profile in relation to depth. All XANES work I have been involved with has been performed at the Australian Synchrotron on the XFM beamline. 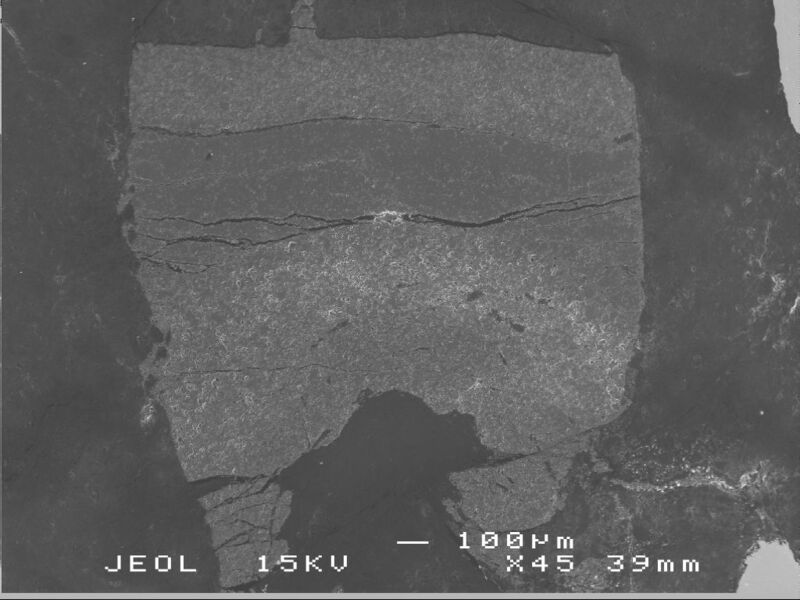 SEM image of an experimental run product. Trace elements in garnet peridotite systems are generally hosted by either garnet or clinopyroxene, however we are still learning how elements are distributed between these two phases. I am performing piston cylinder experiments at pressures and temperatures equivalent to those in the mantle to quantify the partitioning of trace elements, in particular the rare earth elements, in these systems. Experiments are being performed using the 200T (up to 4.0 GPa) and 500T (up to 6.5 GPa) piston cylinder apparatus in the experimental petrology lab at RSES. Experimental products are analysed using the JEOL 6400 SEM at ANU and by LA-ICP-MS at RSES.